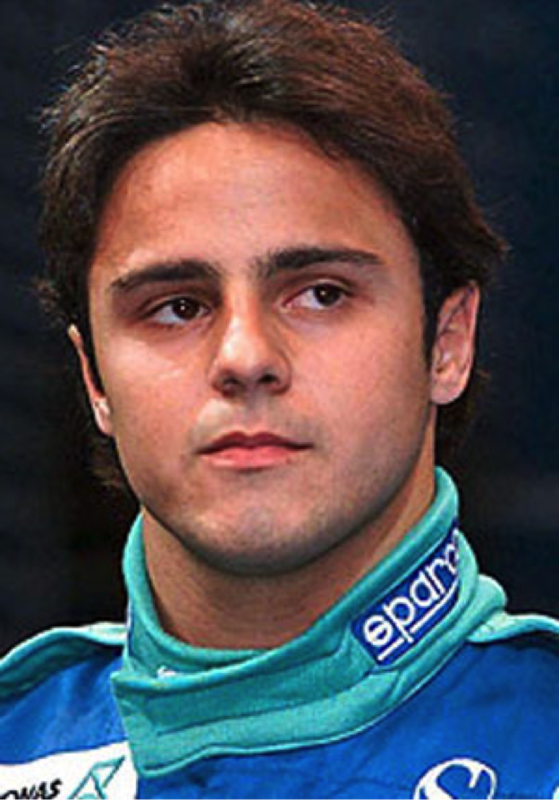 Born in São Paulo, in 1981, Felipe Massa arrived in F1 in 2002, with a three-year stint at Sauber, before joining Ferrari, where he remained for eight years (second only, I think, to Schumacher), before signing at Williams for 2014.
quick to drop him and he was obliged to sit out 2003 until, at the last minute, he was offered a testing role at Ferrari… where he must have impressed someone because Sauber, who used Ferrari engines… took him back the following year. In 2004 Massa garnered 12pts. to teammate Fisichella’s 22pts, with them finishing 12th and 11th in the Championship, while Sauber moved up to the midfield with sixth place in the Constructors Championship. seconds ahead of the battling Alonso and Schumacher… Nobody handed him the win, and he didn’t get it by other cars retiring…! There was an interesting podium controversy when Massa was presented with his trophy by: the ‘President of the Turkish Republic of Northern Cyprus’, a ‘renegade’ state that was recognized by no other nation. Not surprisingly the Cypriot government objected, and the Turkish organisers were fined $5,000,000. In the meantime Schumacher announced he would retire at the end of the year… quitting while still (almost) ahead. 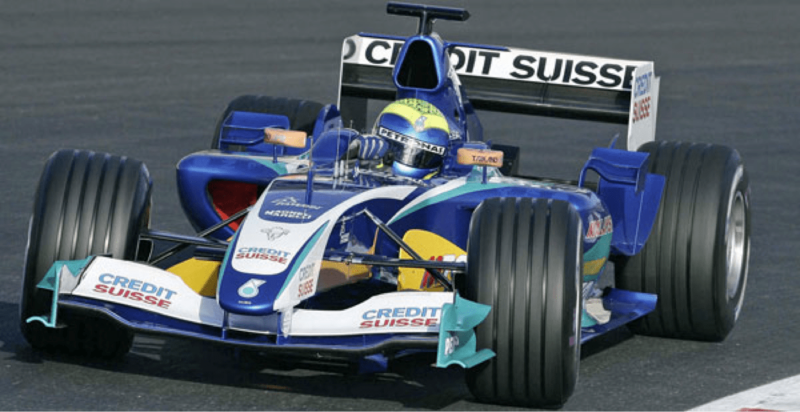 After two poor races, including another crash in China, Massa again beat Schumacher to pole, in Japan, and finished second to Alonso, after Schumacher had his first engine failure in six years. In the final race of the season Massa took his third pole of the year and again out-paced his competitors, to finish first, in front of Alonso, Button, Schumacher, Raikkonen, Fisichella and Barrichello, delighting his home crowd by being the first Brazilian driver to win the Brazilian GP since Senna in 1993. Incidentally, in the middle of the season Juan Pablo Montoya had announced he would leave McLaren at the end of the year, and move to NASCAR for 2007. The next day McLaren announced that Montoya would be replaced by test driver Pedro de la Rosa… instantly ending Montoya’s (not quite) 5-year F1 career. Jacques Villeneuve had been injured in a crash in the German GP, and was replaced in Hungary by test-driver, Kubica, after which BMW Sauber announced that Villeneuve had left the team with immediate effect, with Kubica replacing him permanently for the remainder of the season. German F3 driver, Sebastian Vettel, became BMW Sauber’s ‘third’ driver from the Turkish Grand Prix onwards, replacing the promoted Kubica. 2007 was that season… the one that left a few bad tastes in several mouths… Alonso moved to McLaren to partner new-boy, Hamilton, while Raikkonen left McLaren to join Massa at Ferrari, and a number of Ferrari engineering documents managed to wend their way to McLaren… which wasn’t quite the exchange anybody was expecting. Alonso fought Hamilton (on and off the track) throughout the year with Lewis just beating his Champion teammate by having one more second place, but both were ultimately pipped by Kimi, by just one point, for the Championship. In more congenial circumstances it might have been remembered as one of the most exciting seasons ever. Massa was almost left to pick up the pieces behind the Dueling Duo and the Fighting Finn but, with three wins, six poles, six fastest laps (and all three, in Bahrain and in Spain), four second places and three third places he was only ten points behind the others in the final count. After all that volatility, the new year heralded a new stability in that it was the first ever year in F1 GP racing that each team retained the same drivers throughout the season. It was also the first time for a night race – and I can say, if you’ve never tried it, it is a most rewarding experience. In the year that might have made all the difference to Felipe’s legacy in the sport Ferrari had a bad start, with no points scored in the first four races, and only a fastest lap at Monaco and a podium in Germany to relieve the tension, and frustration. And then came Hungary, where that recalcitrant spring pierced Massa’s helmet and lodged itself into his skull, which put him out for the rest of the season. Massa made a subdued but almost miraculous return to the F1 circus as Kimi ‘stood down’ (at allegedly great expense) for Alonso’s benefit, and managed to qualify in second place in the first event, ahead of Alonso, and took second place in the race. During the year he took four more podium places but was generally outclassed by the ‘new’ opposition and finished in 6th place overall. This was also the year of the (non-)cryptic message: “Fernando is faster than you. Can you confirm you understood that message?” which resulted in a $100,000 fine for Ferrari… but also firmly slapped Massa into the No.2 seat, which cannot have done anything for his moral. However much it was part of the original plan, and regardless of whether Massa had accepted the situation, there is a difference between holding station behind your team-leader (as many others have done ever since Moss and Fangio…), and being brutally told to get out of the way. I don’t object to team orders, and consider them to be an integral part of motor-racing, but,,, there are ways of dealing with it, and there are times when pre-arranged orders can (and should…?) be rewritten. In 2011 Massa recorded two fastest laps to Alonso’s one… and finished ahead of Alonso four times again… but his frequent skirmishes with Hamilton did nothing for the reputation of either driver. For three years Massa thus fluctuated between a solid No.2 player, with frequent podiums; and a return to his previous tendency to ‘leave the island’. He often impressed but also disappointed, and several times came close to losing his place at Ferrari… always seeming to scrape back at the eleventh hour. During this time his team-mate finished: 2nd; 4th; 2nd; and 2nd in the Championship, while Massa managed: 6th; 6th; 7th and 8th. This is perhaps too recent history to require a race-by-race review here (and my space is somewhat limited anyway) but latterly Massa didn’t show enough of his previous talent and, perhaps as with Webber’s relationship with Red Bull, Massa was perhaps also a tad fortunate to be loved at Ferrari. If either driver had been obliged to step down (as did most drivers in this series when their talents were diminished in the glow of the newcomers) it is possible neither would have lasted until the present in competitive teams. It is a career that has so far lasted twelve years, which is not to be sneezed at – a 2nd and a 3rd in the Championship, 11 victories, 25 further podiums, 15 Poles, and 14 fastest laps – and at least one more year in which to increase those scores. Felipe came into F1 at around the same time as Montoya, Alonso, Raikkonen, and Webber, and was joined in later years by Kubica, Nico Rosberg, Sutil, Hamilton, Vettel, Grosjean, and Hulkenberg. Some might feel Massa failed to fully exploit his talent, and might thus dispute his position on this list but, on statistics alone, he justifies being included here and more than holds his own in this group. Great read as always, thanks, it went well with my lazy Sunday morning. I misses the Mark Webber article, when I clicked on it at the bottom of the page and a massage comes up saying it’s not been found. I have tried seveal times is this a tech problem. Just thought I’d let you guys know. Were the pages stuck together after the judge read it? Loving the articles but I am struggling with his inclusion so far up. I don’t think your abacus is reading correctly. After all, Barrichello had 11 wins during his career and fifty further podiums, yet he finds himself four places further down the list. The other point I have always struggled with is the question of moral of a driver. Top level athletes have incredible levels of self-belief and when one is measured against another we are talking subtle differences, not night and day. 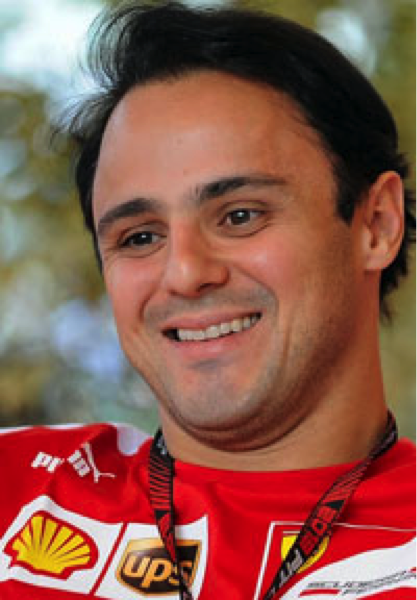 Massa was an extremely well paid driver for Ferrari, they persevered with him despite popular opinion saying otherwise. If he had been that weak that a team decision destroyed him – he would never have succeeded in F1. Fair points one and all, but to counter some of them I have to include Rubens drove for mid grid teams until he joined Ferrari. Even afterwards it was only a glorious year with Brawn that he was at the front once more. He set a pole at Spa – in a Jordan – in mixed conditions but all his pole positions with Ferrari were with a car that had a certain Schumacher in the sister chassis. As to your conclusions when the series finishes, is that not the joy of having differences of opinion? To be honest — Massa is not the material of champion. He was taken to Ferrari exactly to be the second driver — safe, correct, but not so bright driver and so he was. Yes, he was due to get the title once BUT — it was about the misfortunes of Lewis.